Posted on August 27, 2018 | 1393 views | Topic : Events, Latest News, News & Articles. 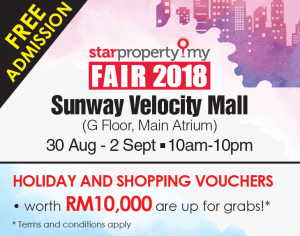 PETALING JAYA: StarProperty.my Fair is now back in Sunway Velocity to showcase some of the latest developments in the country by reputable developers targeting at young families, upgraders, and also those looking for property-based investment opportunities. Participating exhibitors would include, ASM Development (KL) Sdn Bhd, EcoWorld Development Group Bhd, Guocoland (M) Bhd, IWajib Property Sdn Bhd, Mah Sing Group Bhd, Matrix Concepts Sdn Bhd, MRCB Seputeh Land Sdn Bhd, Platinum Victory Sdn Bhd, and Sunway Bhd. Reputable developer, EcoWorld would showcase their Help2Own scheme during the fair which aids potential buyers to acquire 70% housing loan by paying only 5% of the downpayment for their Mellowood development in Eco Majestic (from RM828k to RM1mil); and Ebonylane’s artisan and garden homes in Eco Forest (from RM633k to RM693k and from RM770k respectively). 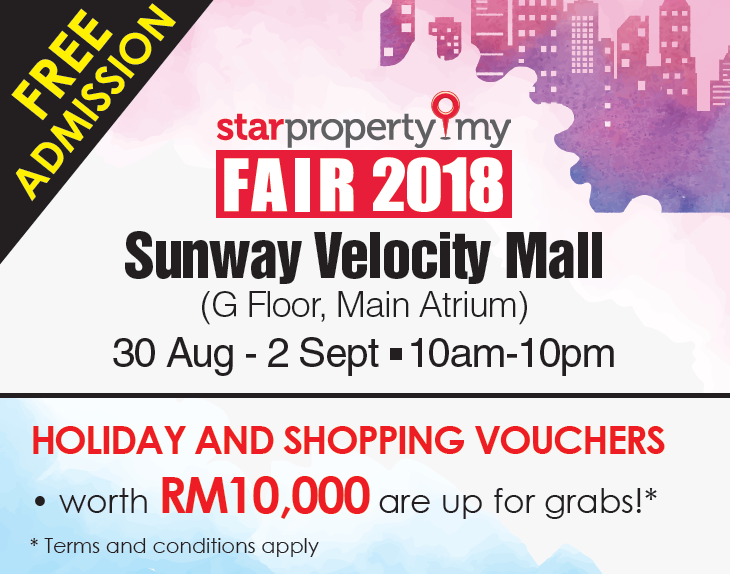 Those who are planning to purchase their dream home at the fair would also stand a chance to win holiday and shopping vouchers at Sunway Velocity Mall from 30th August 2018 to 2nd September 2018 (10am to 10pm). By purchasing a home from participating exhibitors at the fair, those interested can submit a copy of the Sales Order Form, proof of payment, a photocopy of their identification card at the StarProperty.my’s booth to participate. For more information, visit fair.starproperty.my. The fair would not only be catered to adults but also for the young ones as well as among the attractions showcased; it would feature a kids colouring contest for the children to enjoy. The contest would be in two different categories based on age group with each is limited to only 15 participants. Those interested to participate will stand a chance to win prizes up to RM200. The fair would also feature a build and paint workshop where it allows the children to create and decorate tiny homes, even fun games such as “snap, post and win contest”, “Solve Riddles and Win” Contest Stand a chance to win voucher for miniature class or exhibition tickets to MinNature Malaysia would also be featured.